Sun Runner is the new alias of Ric McClelland. You may know him better as Scope, South West Seven or more recently Montel. He’s had formidable releases on many taste-making labels in the past such as Kolour LTD, Toy Tonics and Let’s Play House, all of which are staples we closely follow and communicate with on a regular basis. It was a no brainer then, that we would premiere Sun Runner’s debut. 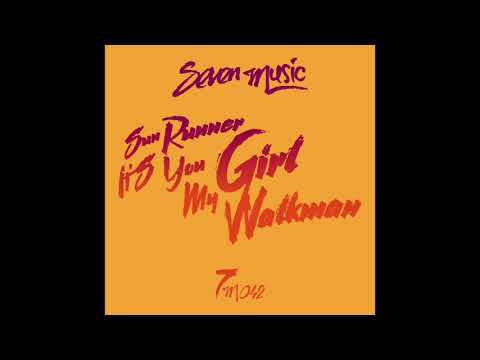 Coming out on Seven Music next week, a label run by Ric himself, the release is simply named after the two tracks, “It’s You Girl/My Walkman”. It’s the formal relaunch of the label after almost a 3 year hiatus. The 42nd release follows two recent compilations featuring the best of the label over the years, with artists such as COEO, Giovanni D’Amico, Replika and others such as Ric appearing under his various aliases. The reason for various aliases is usually to champion a certain sound under each different moniker. Sun Runner focuses on the Disco/House tip. Our premiere today is “My Walkman”. The loopy disco number employs a familiar formula, sampling a disco record and giving it a personal touch with added elements, re-arrangement and a bit of filtering. The beauty in the music is perhaps not the originality but the ability to rediscover samples either familiar or new and blend them into a new track that’s meant to get your feet moving. Sun Runner does this well in a market oversaturated with artists trying to do similar things, albeit less successfully. The other track on the release is no slouch either, a bit more focused on the peak time dancefloor with its thumping drums, looped vocal and its feeling of continuous rising. A release that doesn’t pretend to be something it isn’t, it’s functional and should see plenty of club use. You can pre-order your copy from Traxsource.